He has all of these symptoms except for the blurry vision. In my treatment plan I will laterally tilt head toward the shoulder, and slightly flex the head forward. I will grasp the SCM close to the shoulder side, starting at the head and knead down toward the sternum and clavicle. Depending on how tender the muscle is, I will apply deep transverse friction or apply circular friction. If it is too tender, I will apply light friction. Another method I can use will be to jostle the length of the muscle, and work the muscle fibers between my thumb and index finger. This is a good way to find some trigger points. The muscle will then need to be stretched after the treatment. I decided to use this method of treatment because it was recommended in my Kinesiology book for treatment of the SCM muscle. 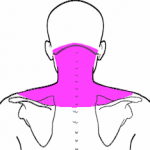 My expected outcome for this treatment plan is to get the SCM and upper trapezius muscle on the right side of his neck to become less tight and for him to experience fewer headaches. I’m glad I have the opportunity to work on his neck as often as needed and to continue to learn the information I need to give him some relief. Follow up: It has been roughly 2 months since I started the treatment plan for the tight SCM. The first month I massaged the neck 3-4 times during the week. The second month I tapered off due to his busy schedule. His right SCM seemed to loosen up a little. However, his neck muscles are still tight and he still gets headaches every now and then. My new plan will be to implement the same techniques and to get back on track with the massage. We need to make a set schedule for a neck massage 2-3 times a week. Good job Leslie! Very nice and concise information about effects of thigh SCM and very good detailed description of techniques.